FIFA is back with another year for more football (soccer), but this time it has been powered by the Frostbite engine. Does this make a difference to the game and does the all new journey mode hold its ground in the FIFA franchise? Let’s find out. FIFA has risen to the surface again, with an all-new look and new mode. This year’s installment of the franchise has been designed with the Frostbite engine to allow for the story-driven journey mode. You play as Alex Hunter, a little kid playing pick-up games in a Sunday league in London, England. Time skips forward seven years, to when you are about to try out for one of the twenty premier league teams. Once you get a grade high enough to make the team you choose which team you want to be a part of. You start off as a substitute; before each game you do some training and depending on how you perform that can determine if you are going to be starting or sitting on the bench. As you play through a few games you get bumped down into another league. Doing well in the lower league will get you called back up to the premier league. Throughout the journey, the way you respond to people can have an effect on you: if you answer a question with a cocky attitude, your followers will go up but the relationship with your manager will go down, if you answer a question cool the manager relationship will go up but the followers will go down. The way you respond to your team mates can also affect your relationship with them off and on the field. Through the course of your journey, you will see your stats increase and sponsorship deals come in as you reach a certain amount of social media followers. All the modes from previous installments of FIFA are there, from season mode all the way to ultimate team. FIFA has done a lot of things right in this year’s installment compared to last year’s, however, the game does still struggle with some mechanics. Passing is one of them; while I am on the pitch and I want to pass it to another player it will go to another teammate that I had no intention of passing it to. As well, during a penalty kick I could not switch my keeper to automatic control, which became very frustrating. FIFA 17 delivers exactly what I needed and wanted in a soccer game, a lot of changes for the good, an all-new story driven mode showing the ups and downs of a professional athlete, Ultimate team mode where you can build your all-star team of current players and legends from Reus to Beckham, and play through the divisions. If you are football fan then FIFA 17 is the definitely the title you want to pick up. Reviewed by ICE at Gamers of the Round Table. 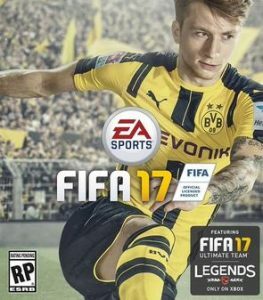 To rent or buy FIFA 17 go to Gameaccess.ca Canada’s largest video game rental service.